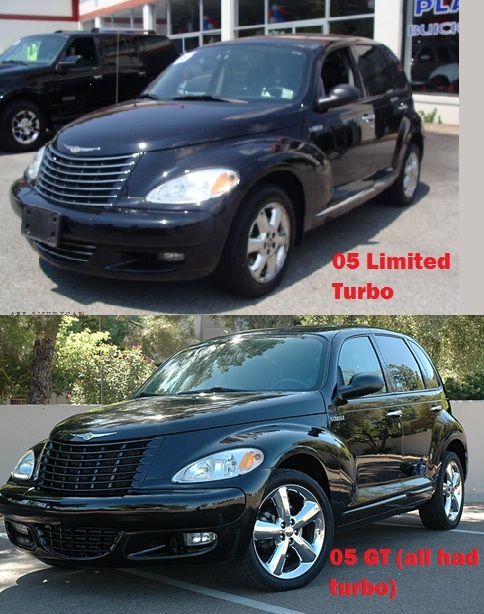 Which PT Cruiser Model do I have? Hello all ..I am back.....! Very recently my beautiful vehicle was struck from behind in a parking lot. I was not in it TG. Subsequently SGI have declared my PT Cruiser a Constructive Total Loss. I am trying to settle with them but the Adjuster is confused as my vehicle does not seem to fit a particular model. The Cruiser is a 2005 with a 2.4 L Turbo engine. The badge Turbo is affixed to the lower right hand corner of the tailgate. There is no spoiler or sunroof or garage opener or partial leather seats. The original Dealership has the service history of the vehicle. Re: Which PT Cruiser Model do I have? The VIN number may tell the story. If you can post that, we may be able to narrow it down. And on the lower left hand (driver's) side of the rear hatch, it should either say GT or Limited Edition. Also you can let your wheels be your guide but either could have or might not have a chrome grill. Last edited by Handy_Cruiser; 05 Feb 2014 at 01:00 pm. Last edited by Handy_Cruiser; 05 Feb 2014 at 12:40 pm. You have a Limited Edition. There were 2 levels of Limited Edition in 2005, you have the lower one, as the upper one had leather. I know yours is a Limited, because for 2005, you had to have the Limited to get the Turbo. I can also guarantee you have an automatic, because the Limited Edition turbo only came with an automatic. The FIRST thing ANY adjuster would to do to write up your incident would be to get your vin number to identify your vehicle for the report. Then in just a couple quick steps on his computer, he will see a complete description/history of your vehicle, ALL of it. That leads me to wonder why this thread exists at all. Did you want to see us stumble through 15 or 20 posts to try to explain how to tell what PT you have, when the vin would have told the adjuster that almost instantly. Makes me wonder if you actually even-------I'll be nice and not go there. Thank you for your help to me. To those Members that responded to my Thread...thank you. To Jerry ...sit down and think how you responded to me, you may need to rethink and readjust how you interact with people. The Chrysler VIN is very specific. There are even threads on this forum on how to read them. It is highly unlikely that your insurance adjuster and his company doesn't use them. It is much more likely the adjuster is playing ignorant in order to pay you less. And for the dealer, they should be able to pull up everything on your car using the VIN. Also, please don't scold the regular members if you want help here. Jerry was simply being incredulous since what you said about insurance and your VIN cannot likely be true. Between you, your insurance adjuster and the dealership, somebody is definitely lying. Instead of picking a fight, you should just explain yourself better and post your VIN as asked. Jerry is exactly the kind of expert that could have helped you with your problem. Last edited by Handy_Cruiser; 05 Feb 2014 at 06:54 pm.